When we think of the term “chefe” or “boss,” more often than not we imagine that person as a man. In our global society, men are typically seen as leaders to guide us, while women tend to be seen as passive caretakers and are often told to take a backseat to a man in power. 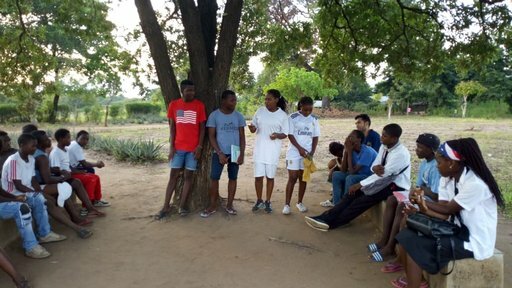 With International Women’s Day having been celebrated recently, and with Mozambican Women’s Day around the corner, I thought it would be great to highlight the girls in my community who are taking a stand against societal norms, and showing the rest of us that girls and women can be bosses just like the men and boys. In my JUNTOS (Jovens Unidos no Trabalho para Oportunidade e Sucesso: Youth United in the Work for Opportunity and Success) group, we have a mix of boys and girls who participate on a regular basis and are eager to learn. When I first started this group, I noticed that the girls would be passive and follow along with whatever the boys would do or say. Especially in Mozambique, girls are usually taught never to challenge a man; your role as a woman is to be subservient and be a “housewife.” With this in mind, my counterpart and I worked to make sure that the girls in our JUNTOS group are heard, and that they have an opportunity to share their thoughts, opinions, and feelings just as much as the boys. In addition to working hard to create an inclusive environment, we also made sure to have girls participate in leadership positions. My counterpart and I came up with five positions and asked who the group thought would be the best fit for each position. We tallied the votes and out of the five positions, four of the girls in my group were voted to be leaders. One was even voted to be “chefe do grupo” (group leader). She will be in charge of working with me and my counterpart in organizing theatre performance practices, making sure people come to the meetings and being a role model for the other students in my group. The current leader of the group was a little timid when she initially joined JUNTOS last year. She would participate, but when we asked the group questions, she would shy away from responding and let the older boys, and sometimes older girls, respond instead of her. This year, it was a completely different story. She organized a list of names of people interested in JUNTOS, she made sure people came on time and she is currently planning events with me and my counterpart. I am so proud of her progress and cannot wait to see what we can accomplish together with our JUNTOS group. 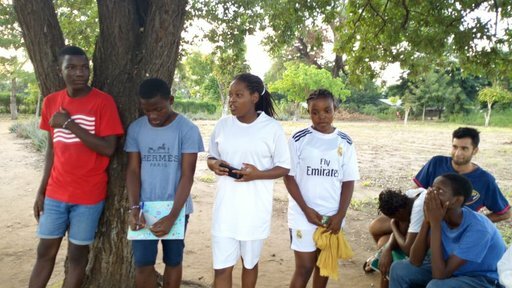 Opening up leadership positions to girls and boys allows them to learn valuable skills in the future and helps to combat the gender stereotypes that are present in this world. Encouraging girls to be leaders can be a difficult task, but leading by example will help girls see that it is possible. I hope to see my girls using those skills they learned in JUNTOS when they become doctors, lawyers, teachers or administrators, and therefore changing the perception that women and girls can be leaders in the community and the workplace. Nicholas Martinez is an Education Volunteer serving as an English Teacher in Manica Province in Mozambique. He has a B.S. degree in Anthropology from University of California, Santa Cruz.